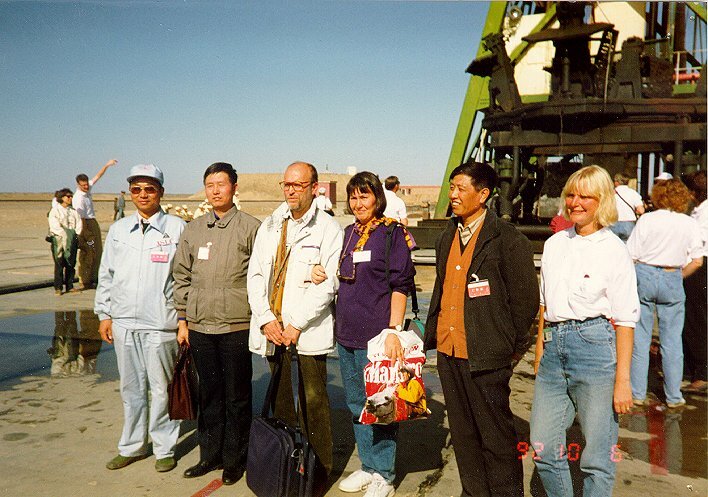 This is an account of my four visits to the Jiuquan Satellite Launch Center in China's Gansu province. 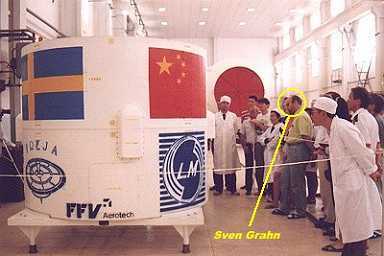 These visits aimed at launching the Swedish Freja satellite on a CZ-2C rocket, an event that took place successfully on 6 October 1992. I served as the project manager for Freja. The Freja project had its roots in Sweden's first space mission, the Viking satellite, that was launched in 1986 to explore the magnetosphere. It also is related to another project. In the period 1985-1988 Swedish space enterprises also studied a store-and-forward communications satellite system called Mailstar to serve Swedish enterprises around the world. This project was supported by the Swedish National Space Board and a company for its execution, MAILSTAR AB, was created by Saab Space, Ericsson, the Swedish Space Corporation, and the company TeleInvest which was a subsidiary of the Swedish Telecommunications administration. The Mailstar project was studied extensively under the direction of the Swedish Space Corporation and a definition study was completed in which firm, fixed proposals were obtained for the the elements of the project. This also included proposals for the launch of the two spacecraft envisaged in the constellation. 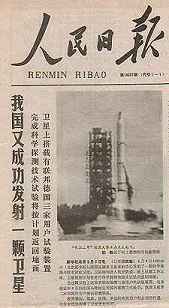 The only viable alternatives in this period were Scout, Ariane piggyback and piggyback rides on the Long March 2C rocket. A launch reservation agreement was signed with the China Great Wall Industry Corporation for the launch of the Mailstar vehicles. The launching arrangement envisaged for Mailstar is shown in the figure on the right. In 1987, when the definition study of Mailstar was in its final stages, it was felt that so-called VSATs (Very Small Aperture Terminals) could be more effective in serving the customers than the Mailstar concept. In effect, the project was canceled. However, the Swedish Space Corporation had signed the launch reservation agreement for launching Mailstar on CZ-2C and felt that the price for the launch was very attractive and could possibly be used for another project. 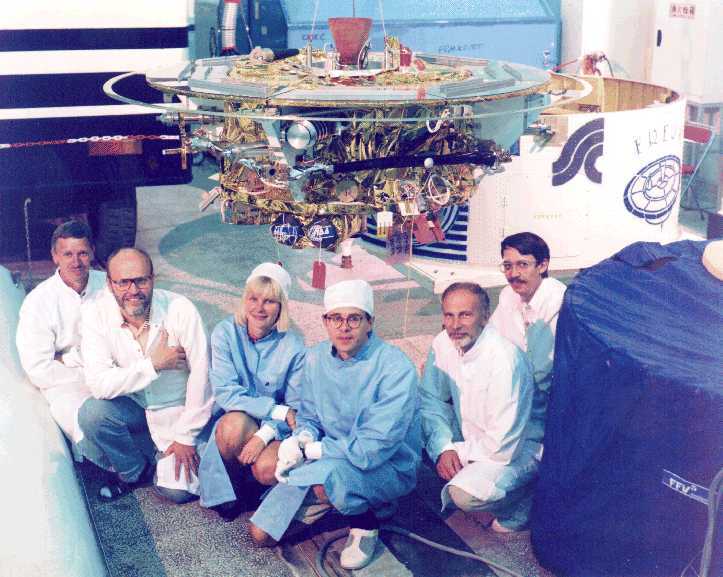 Therefore contacts were taken with the scientists involved with the Swedish Viking satellite to see if a scientific satellite project could be defined that utilized this launch opportunity. 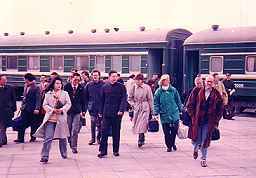 During the autumn of 1987 such a project was outlined and the launching contract was signed with China Great Wall Industry Corporation on 19 November 1987. Just as for the Mailstar satellite, auxiliary propulsion would be needed to reach the operational orbit from the very low orbit provided by the CZ-2C. The new satellite concept, dubbed Freja, would need to a solid rocket motors to achieve an orbit from which meaningful space plasma physics observations could be made. During 1988 this project went through a definition study. In the course of this study contacts with the Chinese were continued, both the commercial partner the China Great Wall Industry Corporation and the rocket manufacturer Beijing Wan Yuan Industry Corporation (nowadays China Academy of Launch vehicle Technology - CALT). As a part of these contacts we received an invitation to witness the launch in August 1988 of a CZ-2C rocket carrying an FSW-1 observation satellite. 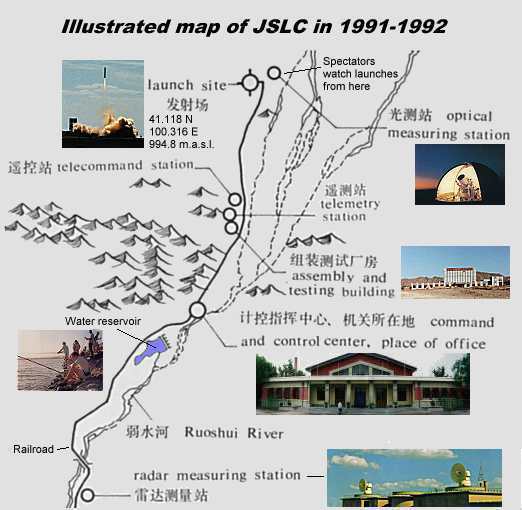 The airport is connected with the JSLC base area and the rest of China via a railroad. There is a train station adjacent to the airport. 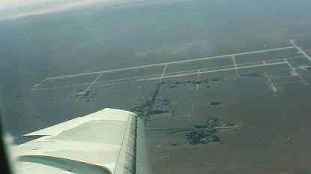 The area halfway between the tip of the wing of the plane and the right edge of the picture is the railway station. All our equipment was flown in by air and transferred to the train that takes about 90 minutes to reach the JSLC base area, also called "Dong Feng", the "East Wind". The train travels through desert and at one point passes near some rather large sand dunes. At that point there is a house with a detachment of soldiers that have as their duty to keep the track clear of sand. 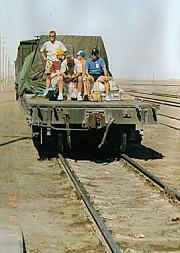 Once, during our stay in September 1992, there was a sand storm the day before we were sending a group of people back to Sweden and when the train reached the dunes, it had to stop to avoid being derailed and the soldiers cleared the track! 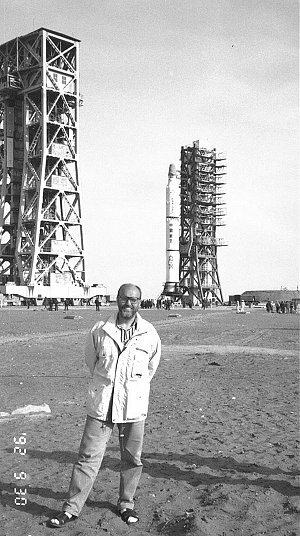 Dong Feng is about 31 km south of the launch pad. 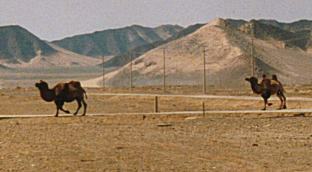 The Technical Center, where rockets and satellites are assembled is situated a bout 20 minutes car ride form the hotel. Each work site at JSLC is to some extent self-reliant. We were somewhat surprised to see that the staff who work at the technical center also live there and keep animals (pigs). The same is true for the launch pad. South of Dong Feng there is a large water reservoir that probably is replenished during the few rainy periods. The reservoir is also used for breeding fish and we actually went fishing there during our visit in June 1991. The Dong Feng Hotel, in "downtown JSLC", "Home away from Home"
The main banquet hall is straight ahead. Our dining room was in the right wing which connected to the hotel room buildings. In 1992 we played land hockey outside the front door at night using our solar array test lamp as illumination. I had the opportunity to be in the first group of foreigners to ever watch a Chinese satellite launch. We had signed the launch contract for launching Freja on a CZ-2C and the Chinese side wanted to boost our confidence in their capability. 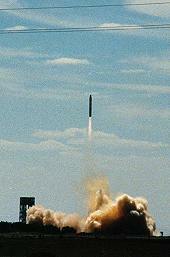 We were therefore invited about two months before launch and treated "royally" upon our arrival on 2 August 1988. We were put up at the Diaoyutai State Guest House in Beijing, a few hundred yards from the stately mansion where Queen Elisabeth stayed during her visit to the PRC. On 4 August we were flown in a Hawker Siddeley Trident jet liner from the Wan Yuan airport in south Beijing to the JSLC airport (#14). 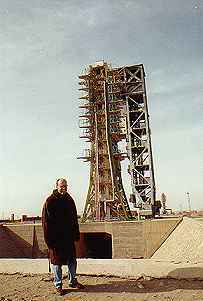 On launch day we were first taken to the launch pad before lunch to see the rocket, still surrounded by the gantry tower. 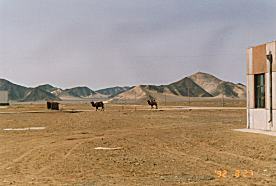 In the afternoon we were transported by bus over the bumpy road to the observation point near a cine-theodolite site some 4 kilometers east of the pad. Tables and chairs were arranged directly on the sand and there were loudspeakers in telephone poles that relayed the countdown in Chinese. of the following day's People's Daily. The rocket took off exactly on time at 1620 local time (0730 UT) and passed above and to the south of our observation point. Actually it felt as if the vehicle passed directly above us, but that was not entirely true. The FSW-1 satellite(1988-67A) entered an orbit at 63 degrees inclination at an altitude of 206-310 km. 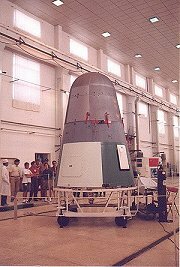 The recoverable capsule of the satellite came down after 8 days, around 0520 UT on 13 August 1988. The next day (6 August) we traveled to the Xian satellite Control center where the satellite was controlled. The flight back to beijing with the Trident jet was very adventurous. A severe rainstorm swept over Beijing and the pilot could not land at the Wan Yuan airport. 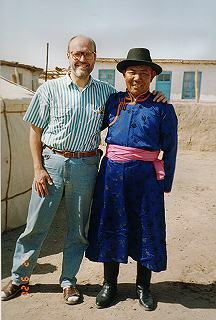 Instead he chose to land at the private airport of the country's top leaders west of Forbidden City. It was the most terrifying descent I have ever experienced. My guess is that the airport for the leadership was chosen because it had adequate ILS facilities..... . We left China for Sweden on 8 August 1988 definitely impressed by the smooth professionalism of the launch crew at JSLC. The visit in June 1991 had as its purpose to work out all the working procedures for launching freja from JSLC. We also inspected the newly built assembly building that we were going to use for Freja. In addition to these technical activities we also visited the daycare center, went fishing at the reservoir and paid a visit to the local Mongol residents. The "BM" building under construction in June 1991. The building had a low office part and a high-bay area where we assembled Freja. The Chinese side had also built cleanrooms in the service tower. The lower, white, cleanroom seen in the picture covered Freja. We arrive at the JSLC railway station after two hours' train ride from the airport (#14), I am in the front, on the right. Myself in front of the flame pit of the CZ-2C launch pad and gantry. 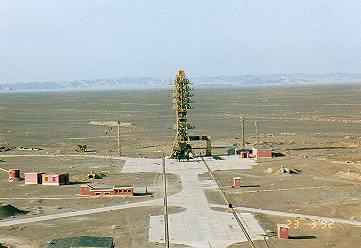 The CZ-1 launch pad from where the first Chinese satellite was launched in April 1970. A view from the gantry looking north-west. 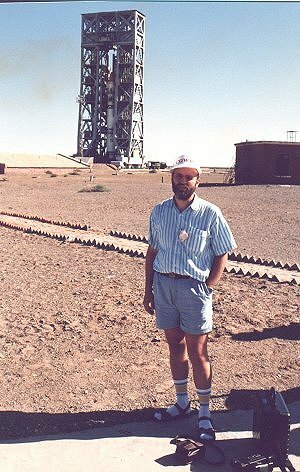 Myself posing in front of the CZ-2C that launched Freja. The date is 30 September 1992. The Swedish team was invited to look at the main satellite. This picture was taken by JSLC. I stand in the crowd on the left. Here we are shown the special adapter in which Freja was carried into orbit. 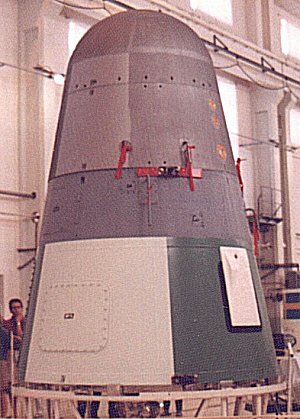 The top section, with the flag of Sweden, became a launch fragment, while the bottom part remained attached to the CZ-2C second stage. The last picture of Freja taken in the assembly hall on 25 September 1992. Myself in the yellow circle. Other team members: Left to right: Göran bergman, myself, Anna Laurin, Peter Rathsman, Bengt Holmqvist, Gudmund Johansson. 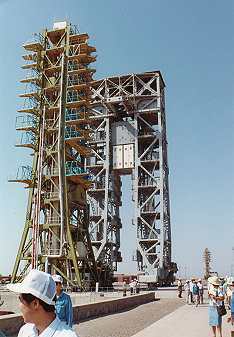 Gathering at the sooty, and still warm, launch pad about 25 minutes after lift-off. The lady with the plastic bag holding my arm is my wife, Inger Albrecktsson. The blockhouse can be seen behind my head. I stayed there at lift-off. The walls were shaking a bit, but not as much as I had expected! 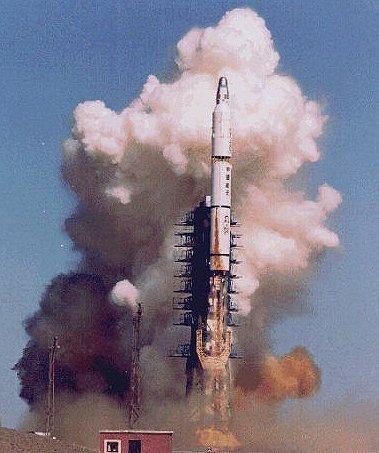 The Long March 2C rocket takes off frpm JSLC on 6 October 1992 at 0620 UT carrying the Chinese FSW-1 satellite and the Swedish Freja scientific satellite.